I'm really enjoying our new town. Surprisingly there's a lot to do around here. Like this event that Alex and I are planning on checking out this weekend. And this festival that I'm excited to attend on Sunday. I also love that Super Target is just a couple minutes away. It's pure bliss. There is, however, one thing that I certainly do NOT enjoy. The street system. It makes no sense. The streets are all curvy and there's a million "Elm Streets" and "Main Streets." There's no sense, no order. In Miami all the streets are numbered, and the numbers go in order. There's nothing confusing about 1, 2, 3. Also, all the streets go east to west and all the avenues go north to south. [or maybe it's vice versa, I'm out of practice] Getting around Miami was a breeze. 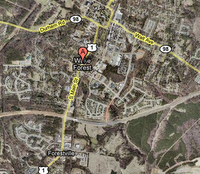 Getting around Wake Forest is a headache! Even Google Maps isn't much help at times. It has led me astray more than once. So that is something for you Miami-ans to be thankful for.